Craft beer has an unrivalled level of versatility. There are great craft beers to drink at breakfast, lunch and dinner, with a sloppy hamburger or in the finest of restaurants. At Beer52, we have tasted many chocolate-infused beers in before, such as chocolate stouts and chocolate porters. But we’re also big advocates of pairing beers with desserts, especially chocolate itself. Milk chocolate best paired with more conventionally ‘chocolatey’ beers, such as porters and stouts. Dark chocolate on the other hand will work best alongside more high intensity beers (think Belgian trappiste beers or dubbels). For chocolates that include added ingredients, like fruit or nuts, look for beers that have matching flavour profiles. Caramel would go well with the malty-toffee flavours of an English barley wine and chocolate with nuts could be paired very nicely with nutty brown ale. A delicious light chocolate is a perfect partner for a bottle of Curitius from Belgium, a beer we discovered recently on a craft beer road trip across Europe. The floral, fruity flavour of this light beer perfectly compliments the creaminess of the chocolate. One of our favourite German brewers is Seb and Peter Esser’s Freightgeist produces some amazing beers but their Hoppeditz edition makes for a really nice partner for this really dark spicy chocolate. The strong, hoppy, toffee-malty flavours stand up well against the kick of the chili. 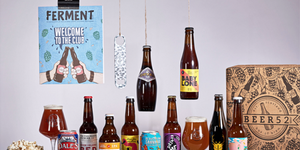 To discover the best craft beers, check out our exclusive Beer52 offer.